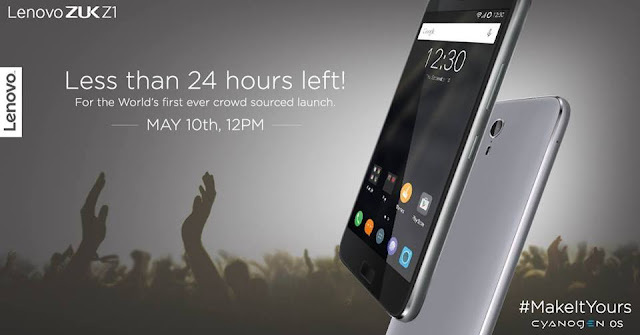 Update: Lenovo Zuk Z1 has been launched for just ₹13,499 on Amazon India. First sale will be on 19th May, 2016 at 2 PM. Register Here for Lenovo Zuk Z1. It looks like Cyanogen is no longer YU exclusive in India as Lenovo India is set to launch it's own brand Zuk which is powered by Cyanogen OS. If you're not aware YU had a deal with Cyanogen which allowed the company exclusive rights to produce Cyanogen powered mobile phones. It was for the very reason OnePlus was taken to court and sale of OnePlus was put on hold in 2014 which ultimately led to end of their partnership. Though it resulted in OxygenOS so that ended up with something good. "It [the deal] was there before that's what I was told by Cyanogen team. But the team now said its ok now. So we are going ahead with the launch"
This pretty much confirms that end of exclusive deal by YU. This news is good as far as Indian consumers are concerned as more Cyanogen based device will be made available in the country. As far as Z1 is concerned Lenovo has decided to drop the ZUK and is marketing the phone as Lenovo Z1 powered by ZUK possibly to capitalize on the brand value Lenovo has made over the years especially in the mid-range market. Specifications wise Z1 is powered by Snapdragon 801 with 3 GB RAM and 64 GB of storage along with 13MP/8MP camera combo. It has 5.5" FHD screen which is powered by massive 4100 mAh battery. It also has Type-C USB connector. As far as pricing goes it was priced at around ₹18,000 when it was initially launched in China so it will be interesting to see how will Lenovo price this device.